← A Disharmony of Powers: Five more years of Erdoğan? In Turkey, the government of the nationalist-religious Justice and Development Party (Adalet ve Kalkınma Partisi—AKP) called early presidential and parliamentary elections for the 24 June. It was aware that its electoral base is gradually eroding, particularly in the big metropolitan areas like Istanbul. Therefore, it did everything in order to enhance the chances of being declared the winner of the forthcoming elections. By anticipating the elections, both president Recep Tayyip Erdoğan and AKP hoped to increase their chances. However, not everything is going according to their plans. The ruling party had obviously feared that a financial crisis might mar its electoral chances. The Turkish economy is highly vulnerable to financial instability. Turkey’s imports outstrip exports. The country displays a current account deficit of 6.2% of the GDP, which is beyond the critical limit. Capital inflows are needed to finance this deficit. And foreign capital inflows fuelled a domestic credit boom. Both companies and households have gone heavily into debt. Household have financed both the acquisition of consumer goods and flats by credits. Consumption is the main driver of present economic growth in Turkey. In order to stimulate the economy, the government has pressured the Central Bank to lower the interest rates. Lowering the interest rates has made capital inflows into Turkey less attractive. The Turkish lira has depreciated massively since the beginning of the year. It has lost about 18 per cent of its value. In May, the fall of the lira assumed critical dimensions. The state president Recep Tayyip Erdoğan exhorted the Turkish citizens to buy lira. This is a clear indication of a dire situation. The strong currency depreciation puts the Turkish banking sector under pressure. Big companies incurred high foreign exchange debts. Currency depreciation implies a more costly debt service for them. Some of them are already unable to honour their obligations. International rating agencies downgraded Turkish banks. In the end, the Turkish Central Bank has increased the interest rate twice in order to attract foreign capital. The increased interest rates will dampen economic growth. And the consumers already now feel the impact of the currency crisis in their purse. Inflation has surged. In particular, petrol prices are going up. The crisis has struck earlier than the ruling AKP circles had assumed. The semblance of economic stability is over. And that is bad news for AKP since “stability” had been one of its main promises in the past. And the financial instability of the 1990s and early 2000s is still relatively fresh in the memories of the electorate. In its election campaign, AKP highlights the government’s mega infrastructure projects and portrays Turkey as a rising international power. The ruling party has, however, not been able to formulate a strong election message. It has rather resorted to negative campaigning insinuating that an election victory of the opposition might endanger the existing living standard. In calling snap elections, AKP had hoped to pre-empt alliance building of the opposition. 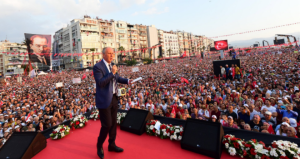 The ruling party itself had forged an alliance with extreme right-wing Nationalist Movement Party (Milliyetçi Hareket Partisi—MHP) that had supported its proposal for constitutional changes, in particular creating a strong presidency. To the surprise of AKP, the Kemalist-centrist Cumhuriyet Halk Partisi—(CHP), the religious conservative Felicity Party (Saadet Partisi—SP) and the Good Party (İyi Parti—İP), which had recently been formed by dissident MHP activists opposing their party’s support for Erdoğan formed a broad alliance for the parliamentary elections. There is only one major opposition party outside this alliance: the left-wing Peoples’ Democratic Party (Halkların Demokratik Partisi—HDP) with its strong backing in the Kurdish areas. HDP is the one party that most clearly advocates a social-democratic agenda. Both the CHP and HDP propose to raise the minimum wage (the CHP would raise it to 2200 lira/month, the HDP all the way to 3000) and end the privatization of the sugar industry, which has recently been initiated by the AKP government. While the CHP promises debt relief for university students, the HDP is pushing for broader relief measures for indebted households. The HDP also wants more progressive taxation, an end to the outsourcing of labour and , an unlimited unemployment payment of 1000 lira and relief measures for indebted households. Due both to these proposals and to the HDP’s ongoing leadership of the peaceful political struggle for Kurdish human rights and greater autonomy for the predominantly Kurdish provinces, several left and socialist organisations have declared their support for the HDP. Whether the AKP might win an absolute majority in parliament will depend largely on whether the HDP will be able to get beyond the 10% threshold. State repression has been focused on the HDP. Many of its members of parliament and activists are in prison. Its campaigners in the streets are assaulted by right-wing activists. The HDP presidential candidate Selahattin Demirtaş is campaigning from a prison cell. 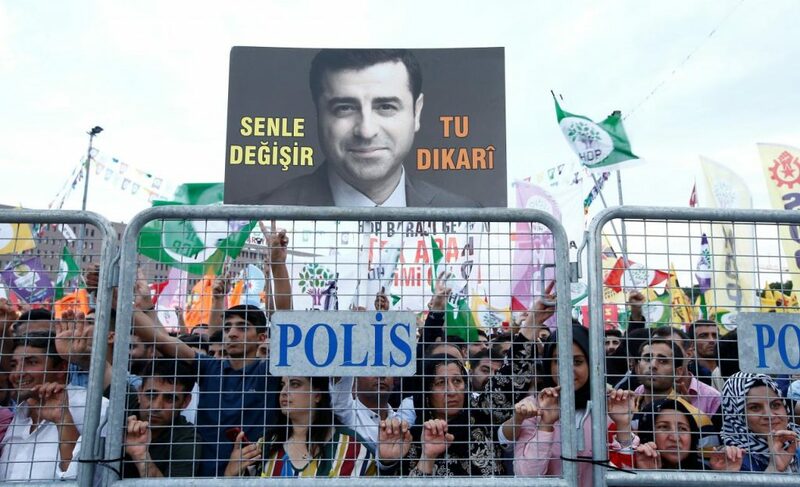 When Recep Tayyip Erdoğan said how impudent it is that somebody in prison is a candidate for the presidency, Demirtaş replied that his hands are bound, but the voters will give Erdoğan the reply that he deserves on election day. And the president seems nervous. The CHP candidate Muharrem İnce is gradually catching up. Though he comes from the nationalist CHP wing, İnce has made cautious gestures towards the Kurdish electorate. This part of the electorate might play a crucial rule if there will be a second round of the presidential elections. The fourth major candidate, the fiercely nationalist Meral Akşener, a hard-line Minister of the Interior from 1996 to 1997, may not be able to attract Kurdish voters—even though the HDP leadership has now pledged to support whoever remains standing against Erdoğan in the case that no presidential candidate gains a majority in the first round, and the election goes to a second round. It seems possible that the Erdoğan will not win an absolute majority in the first round of the presidential elections. In that case, a lot would depend on which an opposition candidate would be able to attract sufficient votes from the other candidates. Opinion polls indicate that AKP is losing ground. However, the opinion polls are highly unreliable. Fewer and fewer people, especially those sympathising with the opposition, are willing to respond in opinion polls. This is indicative of the atmosphere of fear. Opposition parties campaign under the adverse conditions of the state of emergency. Detentions of activists continue, particularly targeting HDP. Many journalists are in prison. Media reporting is extremely biased. From 4 to 31 May, the news channel of the state television TRT devoted in its reporting on the presidential elections 105 minutes to Recep Tayyip Erdoğan (65%), 37 minutes to Muharrem İnce (CHP), 14 minuntes to Meral Akşener (İyi Parti), 5 minutes to SP candidate Temel Karamollaoğlu, 2 minutes to the ultranationalist (and former Maoist) Doğu Perinçek and only 0.3 minutes to HDP candidate Selhattin Demirtaş. The reporting of private news channels is similarly biased. With very few exception, the dailies are controlled by businessmen close to AKP. The ruling party has taken some precautions for the election day itself as well. In the Kurdish areas, about 50,000 voters will not be able to vote at their place of residence but in other places where they might have to travel up to 20 kms. The AKP-MHP alliance passed a new election law in March that permits voting cards without an official seal. Such votes had already been counted (in contravention to then legislation) at the constitutional referendum – and this had raised questions whether those votes had been cast in a regular way. Democratic forces are preparing for watching the elections. Conditions are very adverse for the opposition in Turkey. Nevertheless, the ruling party shows some nervousness. The elections are more contested than it had assumed. 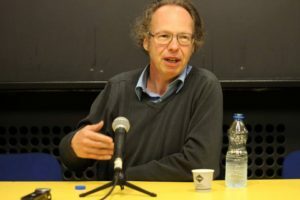 Joachim Becker is professor of Economics and Business at Vienna University and deputy head of the Institute for International Economics and Development. His research interests include state theory, regulation school, development economics, regional integration and disintegration and analysis of Eastern and Southern Europe, Turkey and Mercosur.